Bratz is a popular line of fashion dolls and related merchandise designed by Carter Bryant and manufactured by southern California toy company MGA Entertainment. The four original 10" dolls - Cloe, Jade, Sasha, and Yasmin - are teenagers distinguished by large heads and skinny bodies, almond-shaped eyes adorned with eyeshadow, and lush, glossy lips. Though Bratz dolls fared poorly at their June 2001 debut, their popularity increased the following Christmas. In their first five years, 125 million were sold worldwide, and, in 2005, global sales of Bratz and Bratz products reached two billion dollars. In 2006, a toy-industry analyst indicated Bratz had captured about forty per cent of the fashion-doll market, compared with Barbie's sixty per cent. Bratz have provoked controversy in several areas. Criticism has been leveled at the labor conditions under which the dolls are manufactured in China, and the American Psychological Association has expressed concern about the sexualization of the dolls' clothing and its effect on children. Some of the Bratz characters dress in a provocative manner and the designers at MGA have agreed that the appearance of these dolls were far from how teenagers should dress today. MGA conceded further that many of their styles were sexually provocative and were setting a bad example for the children and the pre-teens to whom these toys are marketed. The original dolls generated a number of spin-offs such as Lil' Bratz, Bratz Boyz, Bratz kidz, and Bratz Petz as well as films, music albums, and interactive DVDs. In 2008, rival manufacturer Mattel filed suit against MGA for infringement, claiming that MGA had improperly appropriated Mattel intellectual property in creating the Bratz. The jury found in favor of Mattel and awarded them $100 million; $10 million for MGA's copyright infringement and $90 million for their breach of contract. After the verdict, Mattel filed for a permanent injunction against MGA, to stop them from making and selling Bratz and to dispose of all Bratz-related marketing materials. The superior court judge granted the injunction, but enforcement of the injunction has been stayed until at least the end of 2009, while MGA appeals the decision. The success of the original four dolls generated an octet of similar dolls in 2002 and 2003. Sets of twins were also introduced. The dolls were sold separately and in themed environments, such as Bratz Genie Magic Dolls. Accessories such as the Bratz Make-up Bag, Spa, Nail Stencil Factory, Playsets, Furniture, Video Games and Cars were released. 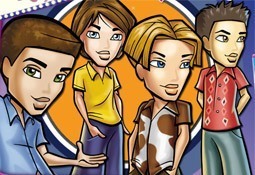 Four Bratz Boyz were released in 2002 with others debuting in 2007 and 2008. Bratz also includes Bratz Boyz Twiins, Adventure Boyz, Play Sportz, and others. Lil' Bratz (2002) are miniature versions of the original four Bratz and eventually included Lil' Boyz based on the Bratz Boyz. In 2007, a clothing line was released called Lil' Bratz Couture. Bratz Babyz debuted in 2004 with molded hair and infant accessories such as bottles and blankets. The line met with a lukewarm reception, but their popularity grew when saran hair was introduced. Other characters from the regular Bratz have been brought to the Babyz. Bratz Lil' Angelz (2007) are the newborn, collectible version of Bratz Babyz. Smaller than regular Bratz Babyz, they include their own newborn pets. Bratz Petz debuted in 2004, proved unpopular, and were discontinued in 2006. They were plush toys resembling foxes, cats, and dogs with their own bags, clothes, and accessories. Bratz Petz have been re-released in Australia and the UK with bobble heads and accessories. Bratz Kidz, the "kid" equivalent of the teenaged Bratz dolls, were introduced in 2006. The dolls were 6" tall and thus, shorter than the regular Bratz. Bratz Boyz Kidz were introduced in 2007 starring four of the Bratz Boyz. Their first movie was released in July 2007 and a second movie was released in February, 2008. Bratz: The Movie is a live-action film released theatrically in 2007. The film stars Nathalia Ramos as Yasmin, Janel Parrish as Jade, Logan Browning as Sasha, and Skyler Shaye as Cloe in a story that follows the Bratz as they start high school. Lainie Kazan and Jon Voight co-star. 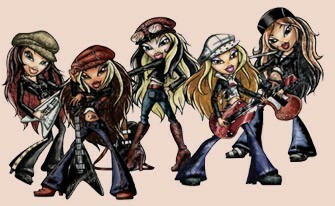 Bratz have seen several direct-to-DVD movies including Bratz: Starrin & Stylin' in 2004, and, in 2005 Bratz Rock Angelz. Released in 2006 were Bratz Genie Magic, Bratz Babyz: The Movie, and Bratz Forever Diamondz. In 2007, three DVD movies were released including Bratz Fashion Pixiez, Bratz Kidz: Sleep-Over Adventure, and Bratz Super Babyz. In 2008, three more movies were released: Bratz Kidz Fairy Tales, Bratz Babyz Save Christmas, Bratz Girls Really Rock, and Bratz Pampered Pets: A Rescue Adventure. .
Music albums include Bratz: Rock Angelz in 2005, and, in 2006, Bratz: Genie Magic and Bratz: Forever Diamondz (album). Albums in 2007 include Bratz: Fashion Pixiez (album) and Bratz: Motion Picture Soundtrack Two albums were released in 2008: Bratz: Girlz Really Rock and Bratz: Babyz Save Christmas. Albums in 2009 include Bratz Pampered Pets : A Rescue Adventure. Bratz had a computer-animated television series, based on a line of toy dolls of the same name. It was produced by Mike Young Productions and MGA Entertainment, and premiered on the FOX 4Kids TV television programming block on September 10, 2005 and ended on April 7, 2007. Nickelodeon announced the October 2008 launch of a Bratz-themed reality show, Bratz Design Academy in which 9 to 14 year olds will compete in Project Runway-type fashion challenges, with the winner designing clothing for a British line of Bratz dolls. Bratz interactive DVDs include Livin it up with the Bratz (2006), Bratz Glitz n Glamour (2007), and LilParty Time (2008).